Just wanted to share my recent favorite creation with you all!! First of all I want you all to check out the "Fintastic" part of the sentiment...I used a special inking technique to give it a scaly look. I inked up the stamp and gentle made marks on it with a toothpick. 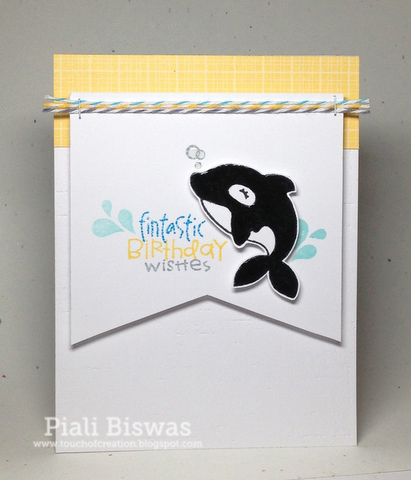 The cute dolphin image is from Paper Smooches-Briny Blue set. I used sentiments from PS-Birthday Buddies set to make my new sentiment. Just added a lil' bit of October Afternoon paper and some Timeless Twine Baker's twines. Glossy accents on the dolphin gives the wet shine to it. 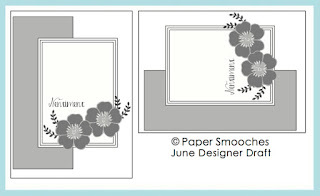 Paper Smooches SPARKS: Designer draft. Loves Rubber Stamps: Masculine theme. Hope you all like this card as much as I do!! Awesome card Piali. I love how you created that effect...it looks like stitching actually. Love the twine treatment too. Very very cute....I love it! Cute, charming, delightful - and a huge helping of 'sweet' added to that as well! Darling card! Cute card. Love the dolphin! cuteness :) love the way you added the twine!! going to have to remember and do that. very cute! Thanks for sharing with us this week at Loves Rubberstamps, hope to see you again soon! PTI Blog Hop-- Touch of Gold!!! CAsual Friday New Release Peeks!!! 10 Minute Craft Dash Twinetastic card!! Paper Made Bakery June Release Bloghop!! !